ASC Computer services off the best in laptop screen repairs Sutton Coldfield. We regularly repair all types of laptop screens from all manufacturers. Just because you have damaged your laptop screen you should not think that the only option is to buy another laptop. Replacing the screens on most laptops is a tricky, very delicate task, but with years of experience we are able to supply and replace the screen on almost any laptop in just a few days. All we need to know is the make and model of your laptop and the exact nature of the damage, or we can come out to your home or office and diagnose the issue more accurately on site. 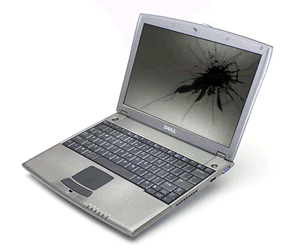 To find out more about our laptop screen repairs just contact us. If you are able to provide us with the exact model and make of your laptop we can order a replacement laptop screen for you and fit it at a location to suit you in under an hour. To identify your exact laptop model just look at the product sticker which is usually on the underside of the laptop – this will normally contain the model or serial number which is what we need to find an exact replacement for your laptop screen.